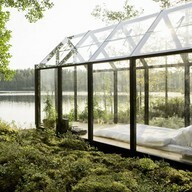 I think this is a perfect Conservatory to relax in on a cold winter's day, taking in the beautiful surroundings. Just discovered your blog an loved reading it! Great post, the image is stunning. I'm sure that all my friends in the Northern Hemisphere would love this, especially if it's centrally heated. How cool to be able to lie beneath the glass roof and see the snow falling but be snuggly and warm - bliss! I'd love a conservatory, I always see them on the UK shows like Relocation, Relocation and wonder why we don't really have them over here. Too hot, maybe? Is it the UK equivalent of "the deck"?